Ten similar notices of the dragon recur in Chamberlains’ accounts over the next hundred years. 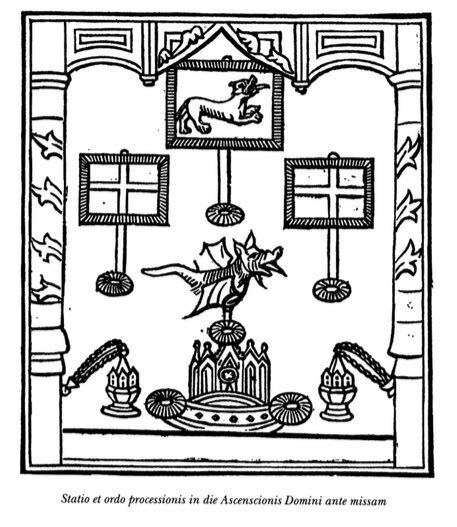 Only two substantive variations occur: in 1472-3 and in 1478-9, the Chamberlains identify the carrier of the dragon by name, William Sawer and Richard Chapman respectively. In all but one of the other accounts, those for 1447-8, 1502-3, 1504-5, 1511-12, 1512-14, and 1525-6, the entry remains basically the same: payment to a man, to carry the dragon, on the three Rogation days and Ascension Thursday. The rate of inflation had no bearing on the stipend, which remained fixed at four pence per day for four days, 16 d. in all. 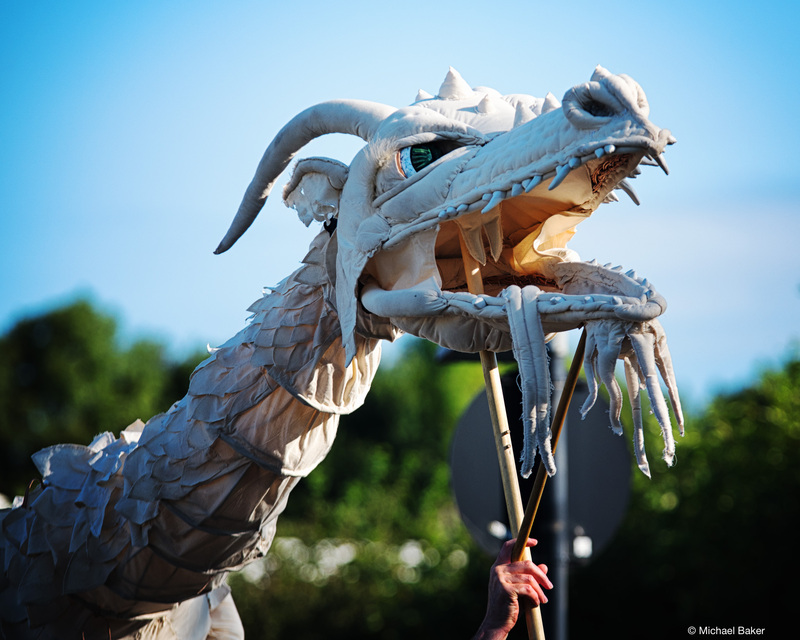 Unfortunately the chamberlains do not describe the physical features of the dragon or its role in the processions in Ripon. A chamberlain, of course, had no need to do so; for accounting purposes what was noteworthy was only how much was paid, to whom, and for what reason. The order of the procession after the first two/three Rogation days, with the lion superior to the banners of the saints superior to the dragon. 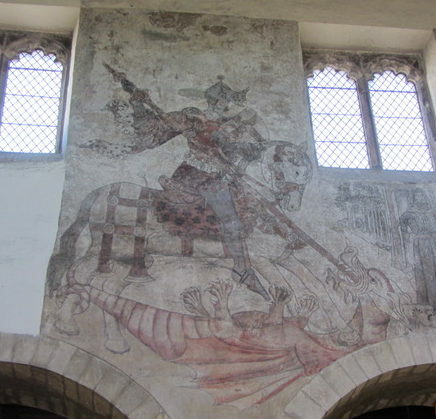 St. George Slaying the Dragon; wall painting from the Parish Church of St. Peter and St. Paul, Pickering, North Yorkshire. Photo credit: Mark Chambers. Although we have no other evidence of performances with the dragon of York, clearly it survived for another performance in Sheffield. 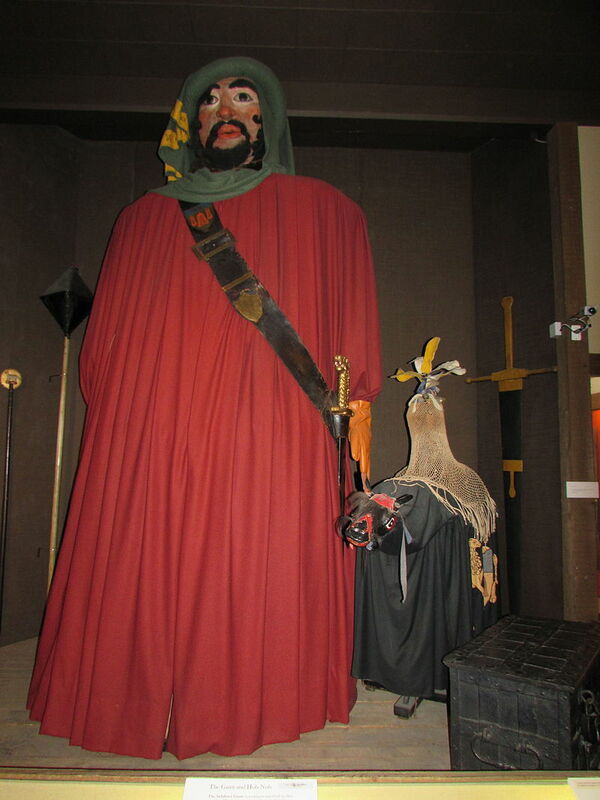 Perhaps these giants were those that normally stood as keepers of the hall in Pontefract Castle. If so, bringing them out to dance on this occasion made the city’s welcome of Jonson quite special. Jonson was not the best audience however. Notwithstanding what had been prepared for his reception, he and his companions fled, taking ‘a by way to escape the Crowd’. And when ‘a swarme of boyes and others crossed over to overtake’ them, they drew their pistols ‘to keepe them backe, and made them believe [they] would shoote them to get passage’. Perhaps supper that day was Jonson’s way of atoning for his ungenerous response to an exceptionally warm welcome: ‘he invited the whole towne to his Venison’ and paid the 41 s. for the wine too. ¹ Leeds, Brotherton Library, MS Ripon 183, CR2 (1439-40), mb 2d. ² See Thomas Liszka, “The Dragon in the ‘South English Legendary’: Judas, Pilate, and the ‘A(1) Redaction,” Modern Philology 100 (2002): 50-59 for medieval commentary on Rogationtide processions. ³ Leeds, Brotherton Library, MS Ripon 183, CR 11 (1540-41), mb 4. * Leeds, Brotherton Library, Wilson MS 295/62 (1635), f 10. † York, ed. Alexandra F. Johnston and Margaret Rogerson, Records of Early English Drama (Toronto and Buffalo: University of Toronto Press, 1979), pp. 319-20. ‡ Quotations are from the Aldersley MS, Cheshire Record Office, Chester, CR 469, ff 8v-9. We are indebted to James Loxley, Anna Groundwater, and Julie Sanders who discovered the manuscript, brought it to our attention, and published a superb edition: Ben Jonson’s Walk to Scotland: An Annotated Edition of the ‘Foot Voyage’ (Cambridge: Cambridge University Press, 2015). 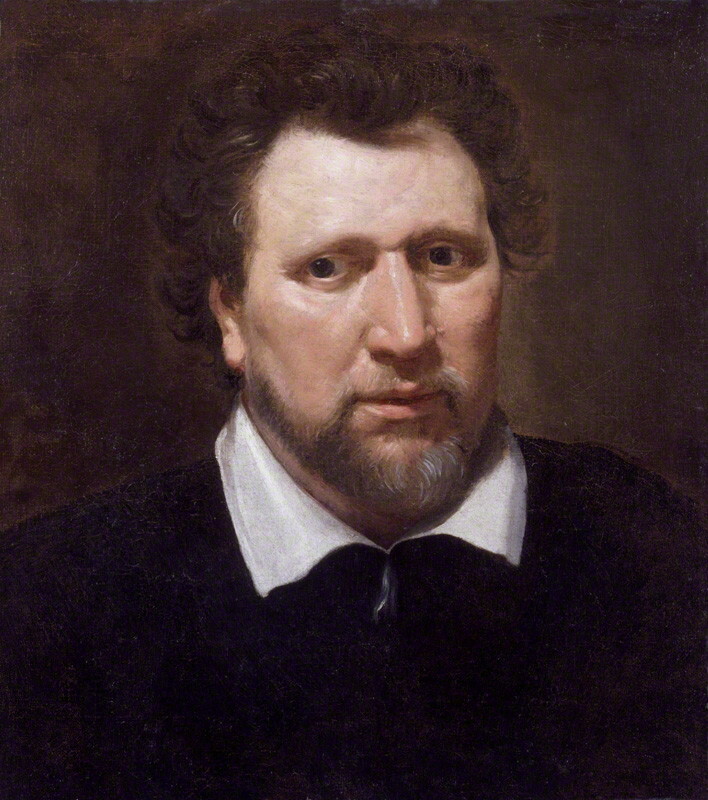 See also the website (<https://www.blogs.hss.ed.ac.uk/ben-jonsons-walk/>) developed by the ‘Ben Jonson’s Walk’ project. ⇒ This month’s Flower is brought to us by the REED Yorkshire: West Riding co-editor Ted McGee.